The world’s most prominent and arguably best metal band, Metallica, visited the city of Herning, Denmark, on Tuesday (27 March 2018). 15,000 fans in a sold-out Boxen Arena witnessed a energetic and well-prepared outfit in top form. Poor sound on the vocals, however, put a damper on an otherwise flawless performance. Opening with the 1975 AC/DC hit “It’s a Long Way to the Top” followed by the legendary Metallica signature, Ennio Morricone’s “The Ecstasy of Gold”, the game was on. Ulrich’s thundering drums tuned in the band’s latest title song “Hardwired to Self-Destruct” immediately followed by “Atlas, Rise!”, also from the new album. Surprisingly, the sound wasn’t at all tuned in, and the two new super-hit prospects drowned in a somewhat diffuse clatter. Sitting next to the sound engineers, this was quite worrying. From countless other gigs with lesser prominent bands, we know that it sometimes takes a few songs to adjust the sound to a crowded hall. But for a setup of this caliber, good sound is expected from the outset! It gradually improved and by “For Whom the Bell Tolls” everything BUT the lead vocal was optimized. 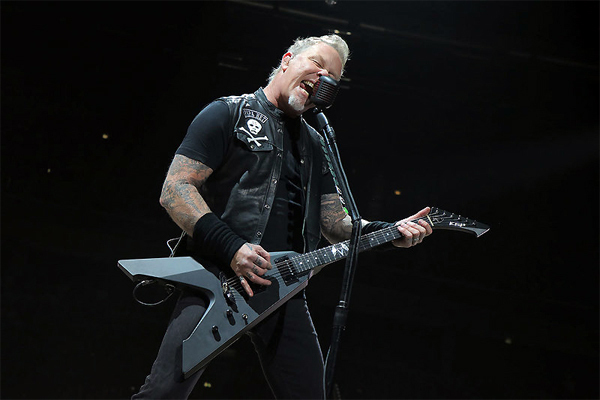 Apart from a few songs, James Hetfield’s singing was hard to hear throughout the concert. To be quite frank – what a damn shame! Well, before you as reader think ‘thank God, I didn’t buy a ticket for that hullabaloo’ we need to underline one thing. Metallica delivered an awesome performance! Extremely well-played, sublime delivery, and with lots of smiles and fun along the ride. Hetfield is the perfect host and his ‘band brothers’ Lars, Kirk and Robert support him all the way. All this combined was what made this evening a night to remember. An example of this support was when Hammett (guitar) and Trujillo (bass) started playing “Rabalderstraede” – one of the most popular rock songs in Danish music history (by Gasolin). Trujillo, singing in flawless ‘Danglish’ (a charming linguistic mix of Danish and English), didn’t have to utter many words of song before an ecstatic crowd sang along. A cheap trick?… At Latebar, we call this showmanship. From roaring laughter during the “Rabalderstraede”-singalong, the mood changed to humble honor as Trujillo segued into an elegant bass solo in “Pulling Teeth” – with pictures of the late Metallica bassist Cliff Burton displayed above the stage. This elegant balance between fun, power, loud, low, fragile, and delicate can only be conducted by true masters of the craft. Elegance is also the word that best describes the visual expression of “Moth Into Flame”. Scores of what looked like mini-drones swarmed out of the stage floor, flying both in beautiful patterns as well as in irregular clouds, buzzing around the artists’ heads, flashing bright white light as to imitate fluttering insects. Cool, that production designers are still able to come up with new effects to add to the rather trivial flames and the fireworks. Danish reviews are generally positive. Here a few: Danish daily Jyllands-Posten gives the gig 5 of 6 stars, the tabloid Ekstrabladet 4 of 6, and the music magazine Gaffa only 3 of 6 stars. Here at Latebar we are closer to 5 than 4. Actually, the only thing we actually can put a finger on was – as mentioned above – the poor sound job on Hetfield’s lead vocal. And it was not even that bad all the time, mostly in the beginning. Songs like “One” and “Nothing Else Matters” were close to perfect. All-in-all the message from Latebar: If you haven’t already purchased your ticket to the WorldWired Tour, go do it now before they sell out. You’ll not regret it. To James, Lars, Kirk, and Rob: Come again soon, please! 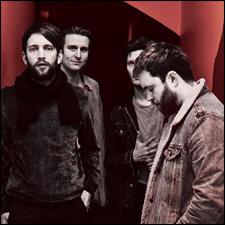 This entry was posted on Thursday, March 29th, 2018 at 10:03 am	and is filed under Music - live. You can follow any responses to this entry through the RSS 2.0 feed. You can leave a response, or trackback from your own site.